NEW MILFORD — It may not have been the hardest hit ball of the afternoon, but it got the job done for the New Milford High School baseball team. The Green Wave trailed Stratford by a run and was down to its final out in the bottom of the 10th inning Friday when lefty-swinging junior designated hitter Jon Luc Dumas strode to the plate. It was a chance to be the hero, and Dumas made the most of it, blooping a single down the left-field line that scored Derek Profita from third base and Nick DiCandido from second to lift the Wave to an improbable 5-4 victory. New Milford (13-5, 8-3 SWC) has won three straight since a tough, 2-1 loss to Immaculate last Friday, and has won five of six. The Wave has gotten big contributions from up and down the lineup. On Friday, it was Dumas’ turn. Stratford (10-7, 5-6 SWC) is still in the hunt for one of the final spots in the conference playoffs, which are set to begin with the quarterfinals next Saturday. With the score tied 3-3, New Milford stranded the go-ahead runs on second and third in the sixth and the winning run on third in the seventh, on first in the eighth and third in the ninth. With one out in the top of the 10th, Stratford’s Braydon Seaburg lined a single to left field, stole second and took third on Gabe Avila’s groundout. Kevan Duffy followed and grounded a dribbler just past the mound, which he legged out for an infield single. Seaburg scampered home from third to give the Red Devils a 4-3 lead. Stratford recorded two quick outs in the bottom of the 10th before Profita lined a single to center field to give New Milford new life. DiCandido then lofted a fly ball to right field that Duffy tracked down for what would have been the final out, but the ball bounced out of his glove. That put runners at second and third for Dumas. It was such an unfortunate break for Duffy, who had played a sensational game. He had three of Stratford’s eight hits and drove in three runs, including the go-ahead run moments earlier. For New Milford, Profita plated a run with a sacrifice fly, smacked a solo home run and added a single. On his home run, the Stratford outfielders — and several spectators — argued that the ball had actually bounced over the temporary, see-through fence in center field rather than clearing it on a fly. Either way, the home run stood, and put New Milford up 3-0 in the fourth inning. Ben Silver had two singles, a walk and a run-batted-in. Dumas had a double to go along with his walk-off single, and Colin Lindner had a single and a walk. 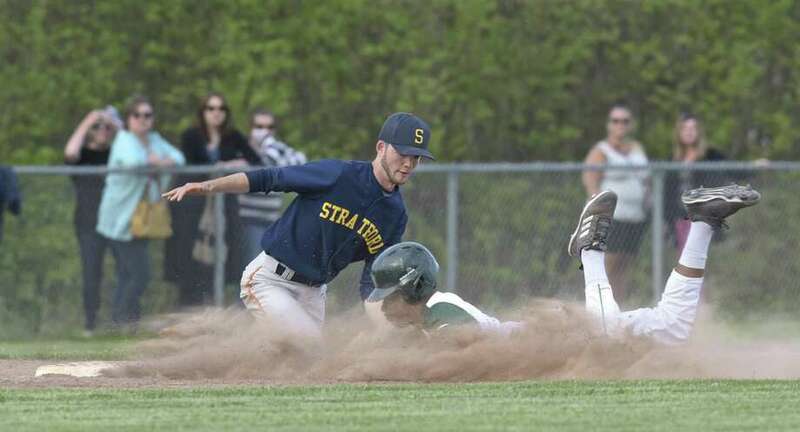 For Stratford, R.J. Burlone had a single, a double and a walk, and Seaburg had a single and scored two runs. Each team used two pitchers, and they all were effective. Zach Prahach started for New Milford and allowed five hits and two walks over five innings of work while striking out four. Ian Cooke relieved Prahach to start the sixth inning and finished the game, striking out six, walking none and allowing three hits to earn the victory. Cam Smith started on the mound for Stratford and scattered seven hits and one walk over seven innings while striking out three. Brendan Duffy relieved Smith to start the eighth and finished the game, allowing three hits and a walk while striking out one. Records: Stratford 10-7, 5-6 SWC; New Milford 13-5, 8-3 SWC. Batteries: S—Cam Smith, Brendan Duffy (8, L) and R.J. Burlone; NM—Zach Prahach, Ian Cooke (6, W) and Derek Profita.